Music students at The Sixth Form College, Solihull showcased their talents and entertained friends, family and staff with an Easter Music Concert this week. A level Music students performed solos and demonstrated their chosen pieces of music, which they have been perfecting for their assessments. This included solos on the piano, cello, flute, classical guitar and electric guitar. Staff and students came together in the College Choir. Their performance included “Bring Him Home” from Les Misérables, the Kate Bush hit “And Dream of Sheep” and other songs. Congratulations go to the students and to staff Chris Phelps and Margot Cooper for all their hard work. 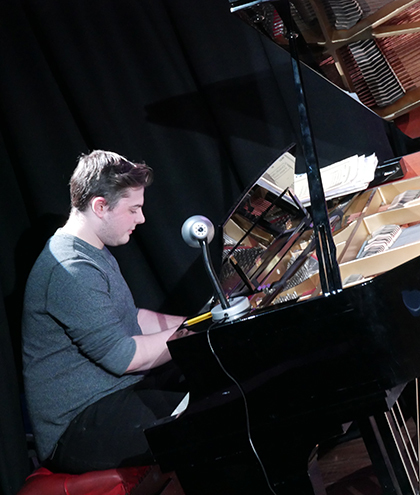 Thanks are also extended to accompanist Chris Collis, who also helped the students for their assessments. The Easter Concert was the final public performance of the year at the College. Students are now focussing on their practical assessments, which make up 30% of the marks for the A level Music course. Another 30% comes from composition work they do and 40% is assessed by examination.